The Triple-A Redbirds may not have the most home runs in the Pacific Coast League this season, but they've put together some of the circuit's most impressive power displays. On Thursday night, Adolis Garcia took his turn. 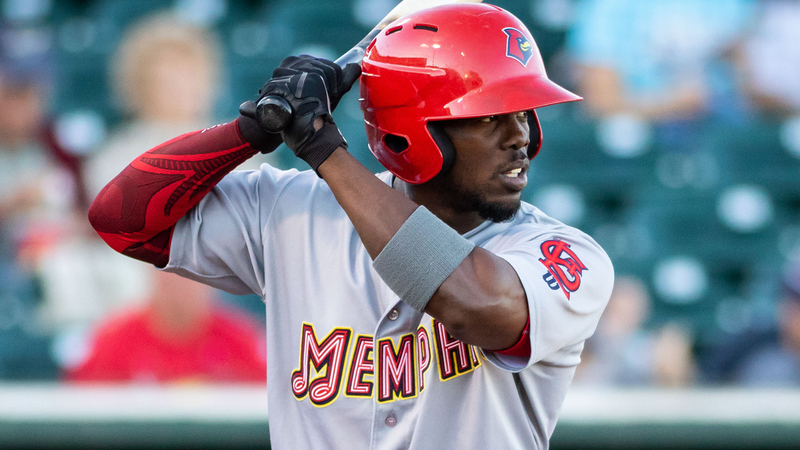 The St. Louis outfield prospect belted three home runs, including a grand slam, and drove in a career-high eight runs as Memphis routed Salt Lake, 12-3, at Smith's Ballpark. "He's been working hard at getting his approach back and laying off of tough pitches," Redbirds manager Stubby Clapp said. "The reward of him having better ABs and laying off tough pitches is he's getting better pitches to hit, and he's not missing." García got Memphis started in the first inning with a three-run homer to left field. After walking in the second and reaching on a throwing error by third baseman Taylor Ward in the fifth, the 25-year-old dealt his biggest blow. With two outs in the sixth, García connected on a grand slam to give Memphis a six-run lead. "He did a great job," the skipper said of García's game-changing at-bat. "I believe he swung through a slider down and away early, and he gathered himself and put a good swing on the next pitch. I believe it was a fastball down, looked down the middle from where I was staying. He stayed inside the ball and drove it out the opposite field with ease. That's the kind of talent he has. When he's got his approach going right and his confidence is strong like it is now, the sky is the limit." Two innings later, with two gone, García swatted a solo homer to finish off his night. The performance was the 25-year-old's first three-homer game as a professional and first multi-homer game since Aug. 28, 2017 with Double-A Springfield. His eight RBIs doubled the previous personal best set on June 24. García has five homers in his last four games. The outfielder struggled in the season's first two months, but has reinvigorated his 2018 campaign since the start of June. After batting .267/.329/.440 in 22 April games, his numbers plummeted in May. During that month, the Ciego de Avila, Cuba native hit .145/.172/.265. His Thursday night showing boosted his July slash line to .355/.380/.750. "It's not how you start, it's how you finish," Clapp said. "My hat's off to him for staying with it. It wasn't pretty there for a while, and he got down and out a little bit, but he's bounced back and found a resurgence and found his swing and his approach at the plate. It's going to serve him well and serve the team well. "When you stop swinging at the bad pitches, you start recognizing stuff that you can hit a lot better, and you square balls up. With a guy like him and his bat speed and strength that he's already got, if he just squares up the baseball, it's got a chance to leave the park at any time. I think it's all about his approach. Now he's getting his confidence back, and he's become the hitter that we thought he could become." Memphis' Tyler O'Neill registered the Minors' last three-homer game Sunday. The second-ranked Cardinals prospect followed with two more long balls Monday. The Redbirds belted five homers and tallied nine extra-base hits among their 14 total knocks Thursday. Ninth-ranked Oscar Mercado and Alex Mejia also left the yard.